In this posting I will describe how you can integrate Oracle B2B 11g and Oracle Service Bus 10gR3 to send messages to Oracle B2B 11g from an OSB 10gR3 service. The most easy way to integrate Oracle B2B 11g and OSB 10gR3 is by using JMS. 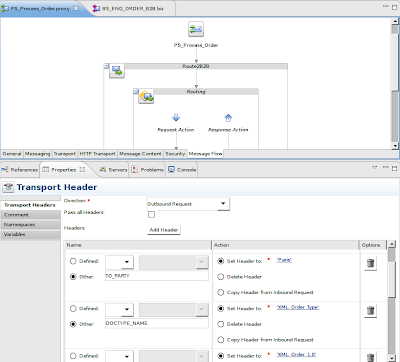 Oracle B2B 11g supports JMS as protocol for its internal inbound and outbound delivery channels out-of-the-box.To enable JMS set the Use JMS Queue as default property to true in the Administration -> Configuration tab in the Oracle B2B 11g management console in order to switch on the usage of the JMS queues B2B_IN_QUEUE and B2B_OUT_QUEUE. I have reused the ebXML configuration that I have described in a previous blog posting in this example. In Oracle Workshop 10gR3 (shipped with OSB 10gR3) you now have to make a simple OSB service that accepts a message through a proxy service and enqueues the message on the B2B_OUT_QUEUE of Oracle B2B 11g using a business service. Below I will describe the details that require special attention while implementing the OSB 10gR3 service. After you have completed the message flow publish your configuration to the server and use the SB console test functionality to execute a test. If we have to do the same thing in a clustered environment where there are two SOA server instances, then how do we do that? To which queue do we send the message to (from the Business Service) to take advantages of clustering. Do we send it to B2B_OUT_QUEUE_auto_2 or B2B_OUT_QUEUE_auto_1 ? Through this blog I share my ideas about Oracle Fusion Middleware technology, middleware transaction processing, integration architectures and other related topics that cross my path.